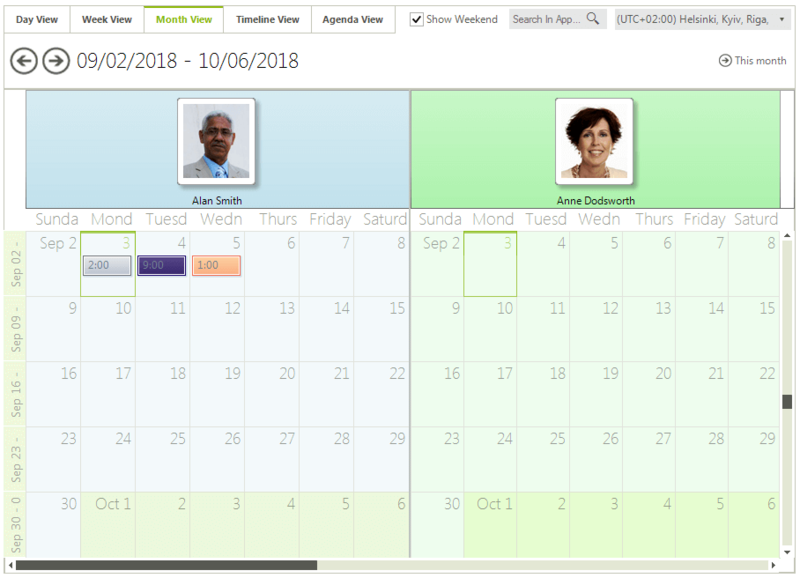 The RadScheduler control allows you to define custom resources that can be assigned to the appointments. 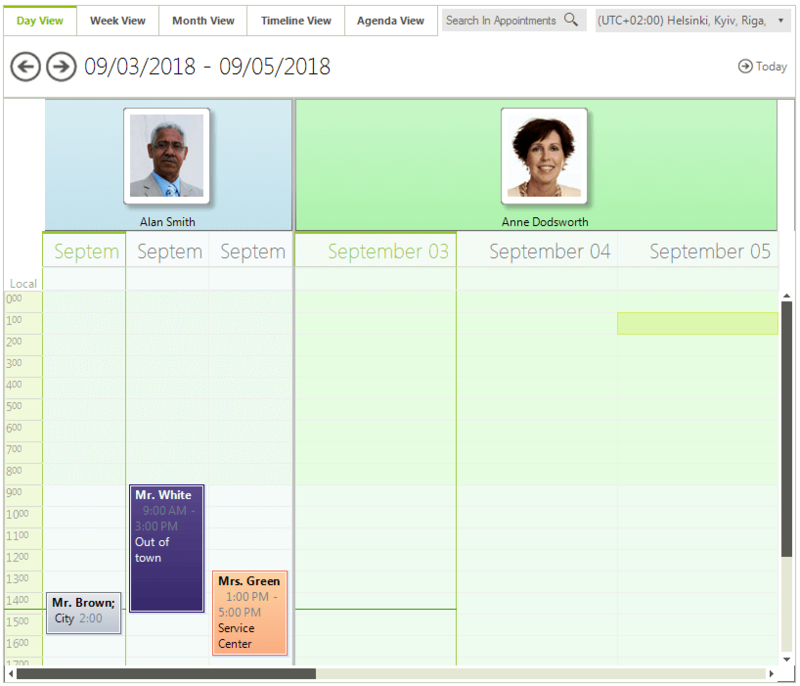 Custom resources let you associate additional information with your appointments. 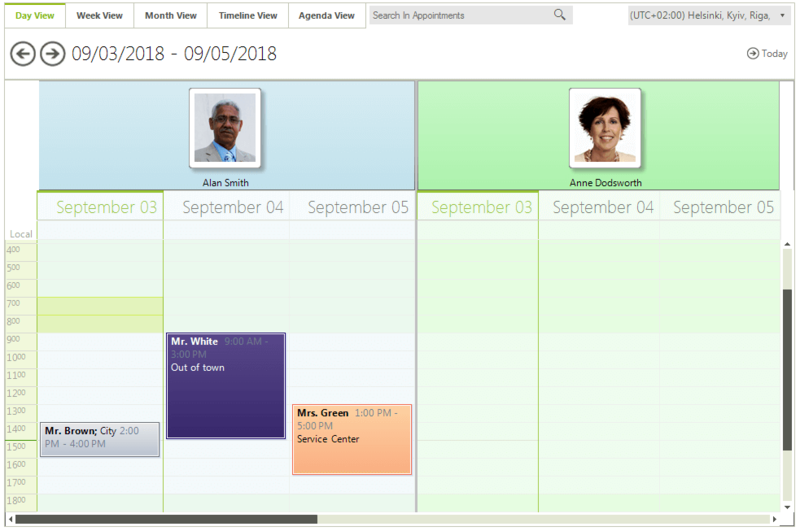 Since custom resources have a limited number of values, RadScheduler can group appointments based on the resources associated with them. For example, you can book different facilities for a variety of events. If you want to group RadScheduler by resources you can use the GroupType property. It has two available values – None and Resources. You can add/remove resources using the RadScheduler’s Resources collection. 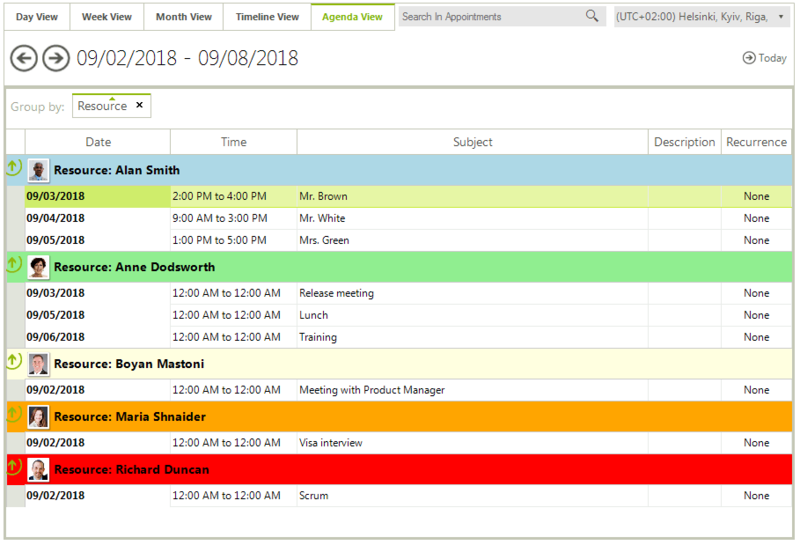 The resources in RadScheduler for Winforms are represented by the Resource class and you can assign it text, color and image values. You can use the view’s ResourcesPerView property to change the number of visible resources. Navigating through resources To navigate to a specific resource you can use the ResourceStartIndex property. To access it, you first need to cast the ViewElement to the base type for all grouped views – SchedulerViewGroupedByResourceElementBase. To track when the resource index is changed, you can use the ResourceStartIndexChanging and ResourceStartIndexChanged events. The first one is fired before the index is actually changed and allows you to cancel the action. The second one is fired when the index has changed and the view was updated. 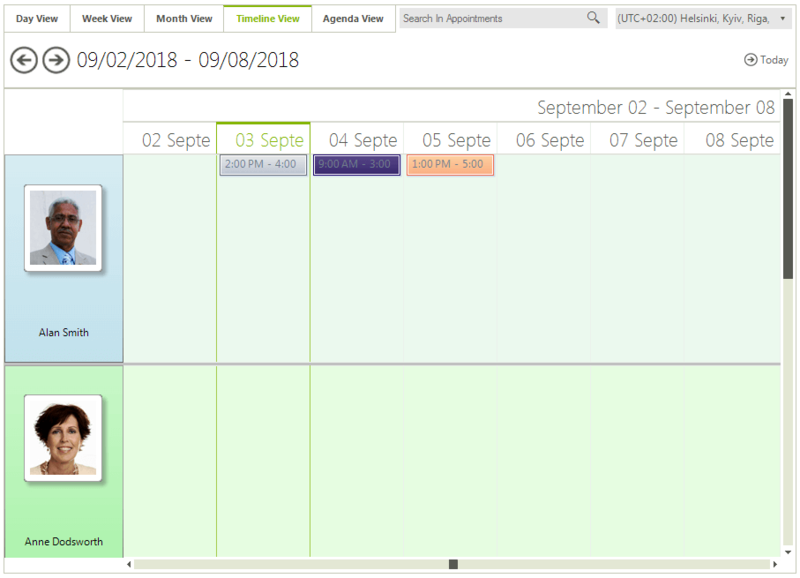 Depending on the currentlty active view the SchedulerViewElement exposes a ResourceHeaderHeight or ResourceHeaderWidth properties which define the height or width of the header. A suitable place to listen to set these properties is the handler of the RadScheduler.ActiveViewChanged event. RadScheduler allows you to specify different size for the different resources. To manipulate the size of the resources, you can use the SetResourceSize and GetResourceSize methods. The values passed to the SetResourceSize method are proportional and the actual size of the resources is calculated based on them. By default all resources have a value of 1 and therefore if you set a value of 2 to any resource, it will stay twice as bigger compared to the others. When grouped by resources the type of the RadScheduler.ViewElement is a descendant of the SchedulerViewGroupedByResourceElement class. This element is built of descendants of the base SchedulerViewElement class and their count is determined by the count of the resources per view. The exact type of the child SchedulerViewElement instances is determined by state of the currently chosen SchedulerViewType. 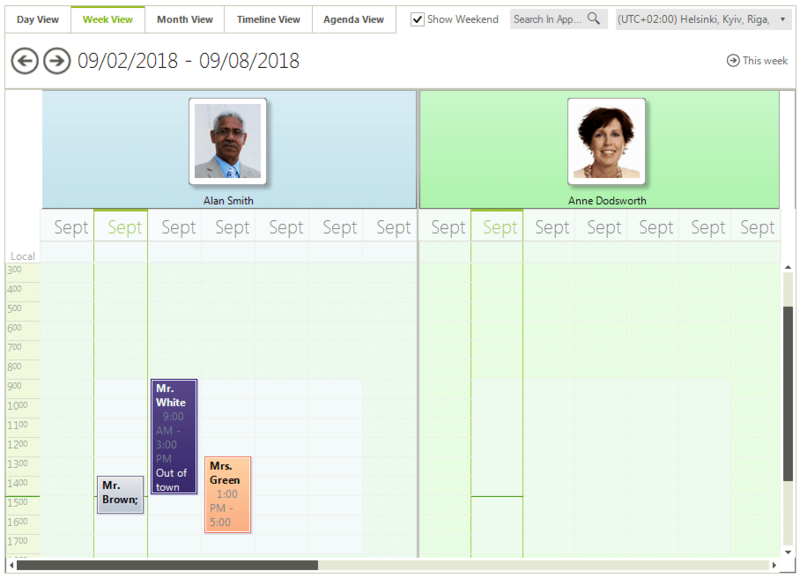 Each of the child SchedulerViewElement objects has a single associated resource when the control is grouped by resources. The example below demonstrates how each of the child view elements can be accessed, and has its own settings for a particular resource. Due to the UI virtualization the logic for accessing a particular view element associated with a resource needs to reapplied when the current resource or selected view type changes. This can be performed in the handlers of the ActiveViewChanged and ResourceStartIndexChanged events.